This is so delicious. Even my picky kids (who HATE anything green and remotely healthy) loved this. I used cheddar cheese this time but can't wait to try it with feta. 1 Set oven to 350°F. 2 Generously grease a 11 x 7-inch baking dish. 3 In a large bowl, combine all ingredients with a wooden spoon, mixing very well to combine. 4 Season with salt, pepper and cayenne to taste. 5 Transfer the mixture to the prepared baking dish then sprinkle with Parmesan cheese. 6 Bake uncovered or covered for 25 minutes or until set (over baking will cause a heavier denser texture if you prefer a lighter texture then bake just until set). 7 Top with mozzarella cheese the last 5 minutes of baking (if using). 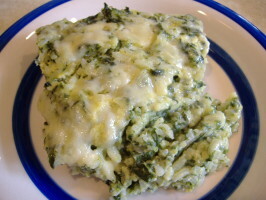 8 Note: for a more fluffier texture casserole, 4 eggs may be used.